This is so pretty! I love the touches of gold! It's so light and airy and really different too! LOVE it! This is so pretty! I love the textures and dimension you added with the thread and the stitching, and the pretty gold accents. Beautiful card! And your little toucan girl all ready for the party is really sweet. 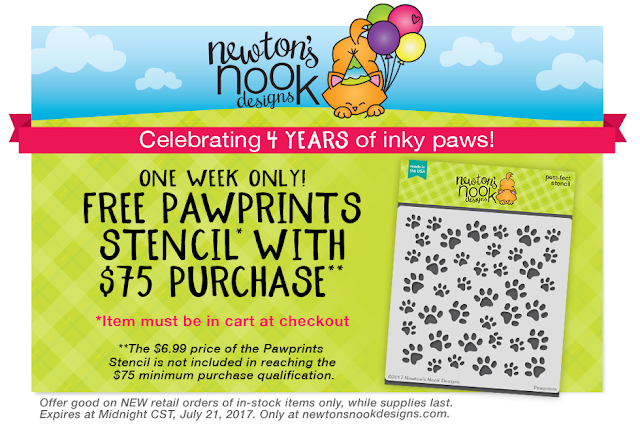 What cardstock did you use? Or did you draw all the leaves and flowers yourself? Who thought a toucan could be elegant? Obviously you did and you nailed it! I simply adore this! 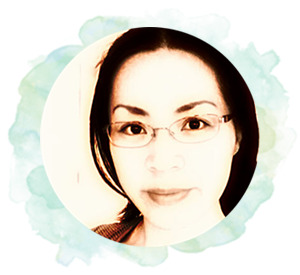 The background you created is beautiful and your coloring is gorgeous! Thanks for all the inspiration this week! Gorgeous card! Love the gold and all of the beautiful layers! The gold accents are wonderful and I like how you added the twine. Awwww! 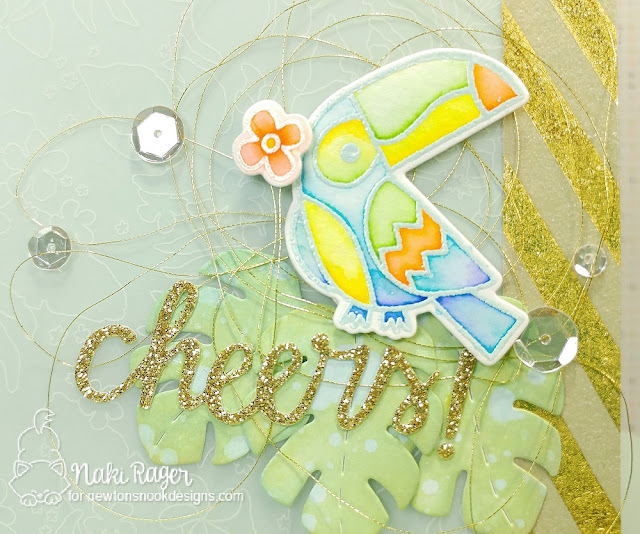 such a sweet toucan card! I love it! You and I are on the same wavelength - I also used the hibiscus die with my card today! Thank you so much for helping to celebrate our Anniversary today! Such a sweet card with pretty soft tone! So pretty with the gold thread and other gold accents..your coloring is always stunning! 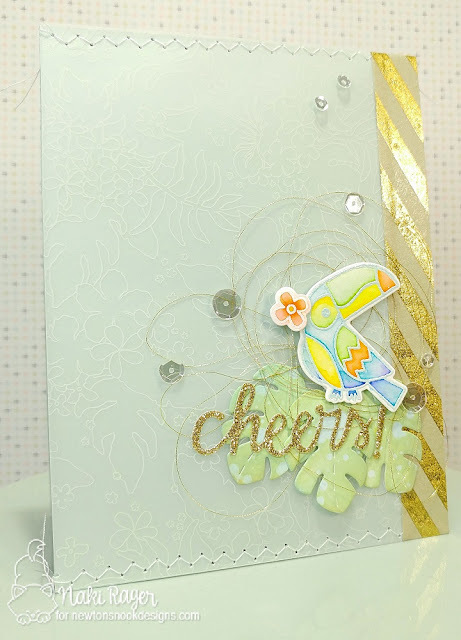 Love the watercoloring on your sweet card! 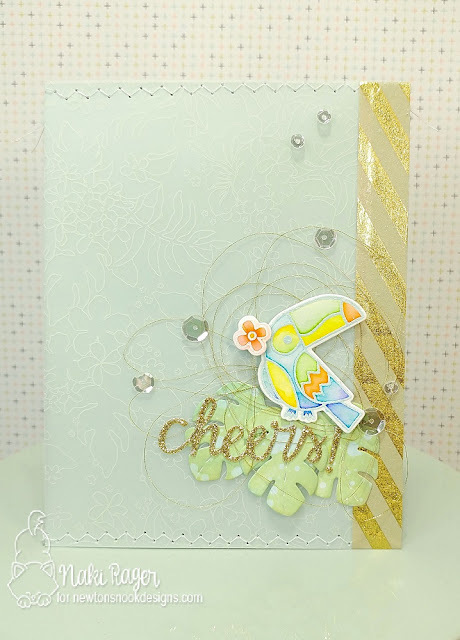 Love the details on your pretty card! The toucan is fabulous! Very pretty. I love the soft coloring. So pretty and light and airy! Great job! Stunning card with all those different gold details. Pretty toucan bird too. Gorgeous toucan and awesome touches of gold. So pretty! Love the gold and your coloring of the bird is awesome! Thanks for sharing your idea using Newton Nook's stamps. What a lovely card with the addition of gold and the lightly colored in toucan. Very pretty with the gold accents. Pretty creations! Love the background and how you colour your toucan. Very fresh and bright! Such a different look. It's lovely. The toucan almost looks like stained glass. lovely card, love your little details! This card is so pretty! I love the pastels and the gold accents mixed together! She is a pretty toucan with that little flower on her head! Very pretty card. The touches of gold are lovely. I think this is stunning and elegant. Love the soft colors & the gold. And the sweet flower on her head; just darling. Beautiful! Love the embossed background, the soft colour with the gold...and that awesome little touvcan!! The gold is a beautiful touch to this card!